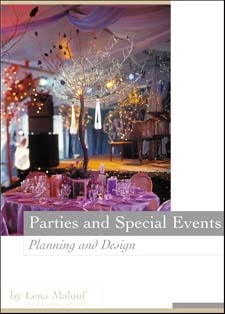 PARTIES AND SPECIAL EVENTS is THE BOOK for the special event professional. Legendary international event planner and artistic designer Lena Malouf offers her expertise, flair, and her world of experience in this wonderful book. This fantastic book puts Lena Malouf's more than four decades of event planning at your fingertips - a resource that will become your primary reference and design guide - your professional "bible". Lena Malouf is the consummate professional who possesses breathtaking creativity and outstanding skills balanced by the organizational know-how necessary for Parties and Special Events. There is not another book like this one. 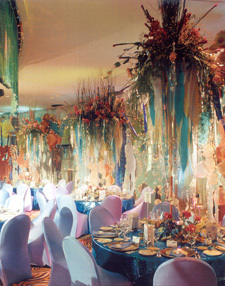 More than 200 full-color photographs of innovative corporate and private events are included. Each event is described in detail by the author. Filled with topical, classical, modern, unusual and inventive themes that work! Chapter 1 - The Party Process tells you how to build, motivate, communicate with and manage teams. It explains the importance of administration and paperwork for clients and contractors, and covers delegation and coordination of the events. Chapter 2 - Themes stunningly illustrates events from concept to completion. Exciting ideas, theatrical sets, profitable props all displayed with a difference. Creativity jumps off the pages. 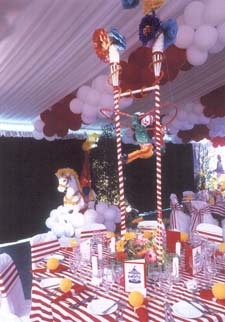 Award-winning events and nominations are also beautifully portrayed showing "wow" factors and elements of surprise. 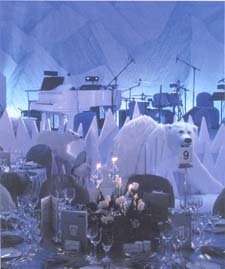 Chapter 3 - Nothing But Tables, Flowers and Fabrics looks at items which are an integral part of any event. Tables are dressed to impress. Tabletops show formality, informality, occasions, all with originality and distinction. Full settings are presented while floral arrangements and fabric accents bring up-to-the-minute styling in a kaleidoscope of color. New Low Price $99.95 + shipping - SAVE more than 40%!